Alanda July 11, 2017 Leave a Comment This post may contain affiliate links. I had just spent a few days in Brisbane to catch up with family. It was one of my daughters 50th birthday and I didn’t want to miss that milestone in her life. While there I also caught up with my other children, my grandchildren and my great grandchildren. It was a first time meeting my youngest great grandchild so that was a big thrill, and there were lots of kisses and cuddles all round. My daughter in law, Stacy, is a very talented quilter and embroiderer and turns out some amazing projects. She has just purchased a long arm quilting machine and I got to have a go. She has her ‘Sweet 16’ attached to the frame. I found it so much easier to quilt standing up. Like everything it takes practice. Stacy was telling me that instead of doing little projects she found that making simple quilts was an easier way of learning to use the long arm, plus she has a finished quilt at the end that just needs to have the binding attached, very practical. 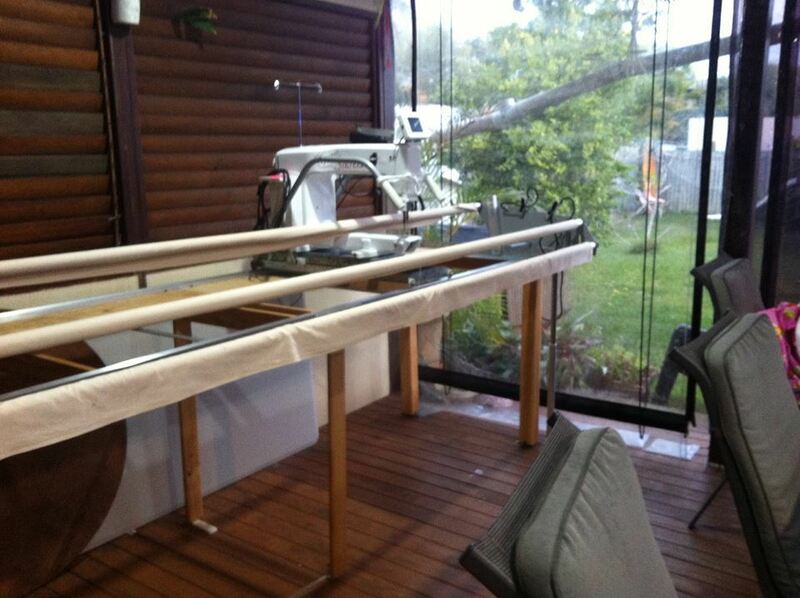 Have to say that a long arm quilter is now on the bucket list. So when I arrived back home, Paula and I decided to head off down to Wodonga to the Craft Alive fair, but before that we thought we might spend a night in Beechworth, so that we could be up bright and early to drive up to the craft show which was only about 40 mins away. 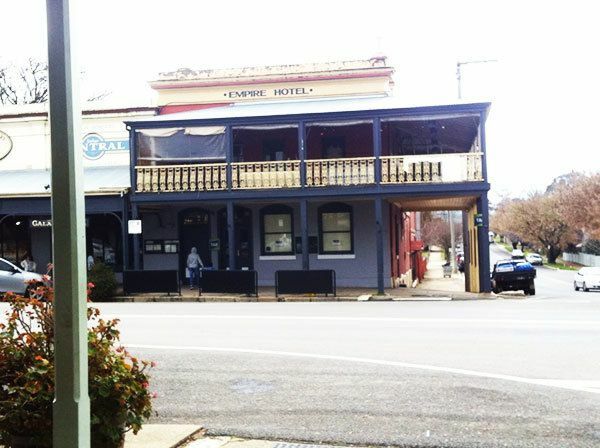 Beechworth is one of those quaint old gold rush towns in North East Victoria. I love visiting old towns that are so full of history. The streets are reminiscent of times gone by with verandah covered footpaths and historic buildings. You can also visit the original courthouse where the notorious outlaw Ned Kelly was arraigned. 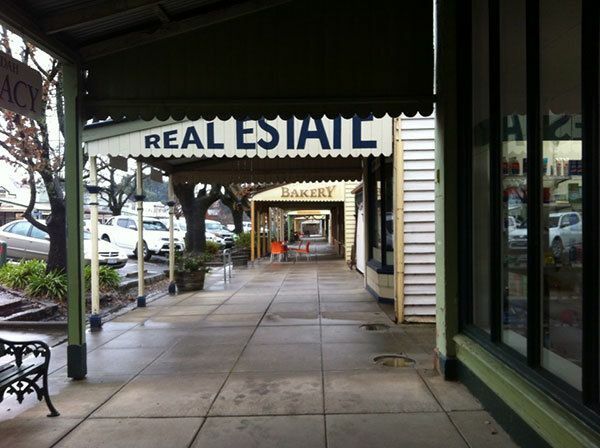 I love the old style verandah’s. 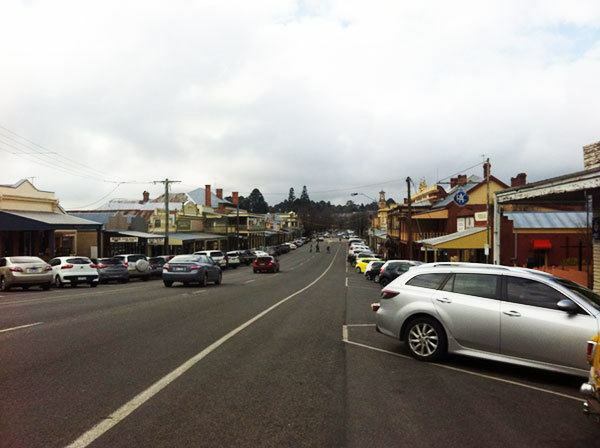 Looking back down the main street of Beechworth. 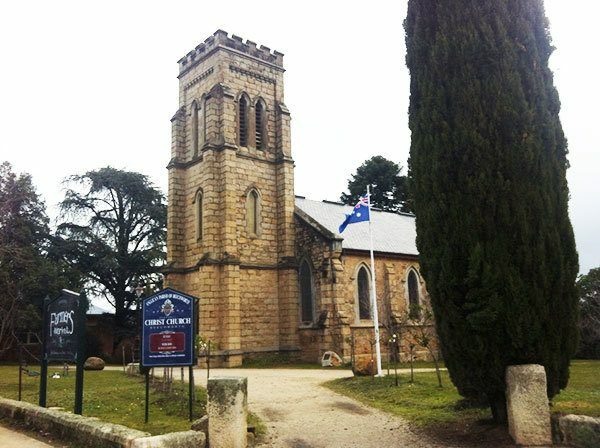 The foundation stone of the Anglican Christ Church was laid in 1858 by Justice Thomas Spencer Cope. The tower was built in 1864. You can find out more of the history of this lovely old church here . 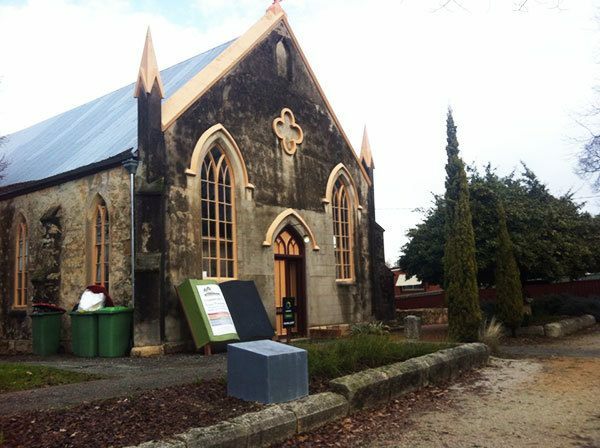 Across the road from Christ Church is another lovely old church that is now a Centrelink Office. We took a stroll around the town and ended up (of course) at the Beechworth Bakery. We had done some research before heading off Beechworth and the bakery was one of the places we wanted to visit as it has great reviews on Trip Advisor. It was quite busy, being lunchtime, but the staff are efficient and it wasn’t long before we were served. Actually the longest part was making a choice, there are so many lovely treats on offer. I settled for a steak pie and Paula had a spinach and fetta pastry. Both were tasty and didn’t take long to devour, we were quite hungry after our long road trip. We also purchased a blueberry muffin and a beesting to have back at the hotel. Beestings are one of Paula’s favourite cakes. I hadn’t ever had one as I am not a fan of confectioners custard, but I have to say this one was delicious. So much so that when we found a branch of the Beechworth bakery in Wodonga the next day, we bought some more of them to take home. We also visited the Honey Shop and picked up some lovely creamy honey that is infused with figs and ginger. It really is delicious. While there you can also check out the honey tasting section of the shop and the beehive display where you can see the bees doing what they do best, making honey. There ‘s lots to see and do but we were only there for the afternoon. So after visiting the bookstore, which is situated in an old church, we headed back to our hotel, the Best Western. 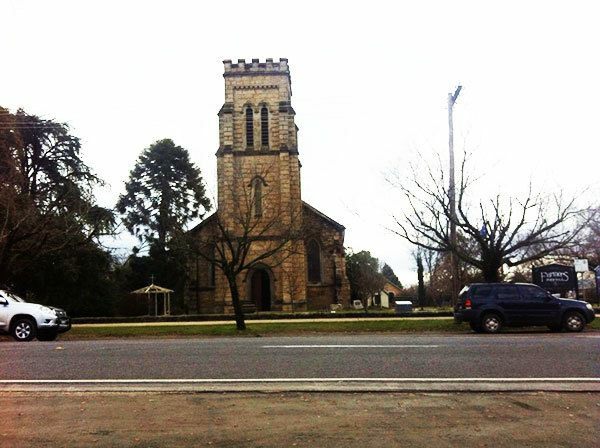 But we have decided that we will definitely visit Beechworth again for a longer stay. The next morning we headed out to Wodonga but took a side trip to Yakandandah which is on the way. Yakandandah is another small town with a population of around 950. It was wet and windy but we braved the elements to take a wander up the main st. Again this is a former gold mining town. The commercial centre has been classified by the National Trust and there are many well preserved buildings that date back to the 1800’s. We found a store full of antiques and old memorabilia. We both love this sort of thing and so we spent quite some time meandering around the store looking at things that I haven’t seen in many years. Just love the nostalgia of seeing old dolls, irons, sewing machines, tools and bric a brac from times gone by. We hadn’t had breakfast and although there were a couple of cafes with really lovely looking food, we decided to wait until we got to the craft fair. Big mistake, the fare on offer at the craft fair was nice but unfortunately there wasn’t any hot food. So finally we are at the Craft Alive Craft Fair. We headed straight for the Echidna Stall to meet up with Amanda to chat about the Dream Machine 2 and we sat in on her demonstration. Such an amazing machine. Then it was time to take a spin up and down the aisles. We got chatting to the lass from Baby Lock. She was demonstrating the 5 needle Baby Lock Embellishing machine. We have just purchased the 12 needle and have some tutorials planned on how to use it plus some projects. Got conned into buying some stain remover from a very nice gentleman. Actually bought 3 bottles of the stuff which will last me 3 lifetimes. And as always these things never work quite as well in reality as they do in the demonstration. Its just a pleasure walking around seeing the beautiful projects that people create – gorgeous quilts, lovely scrapbooking pages and cards. The hot fix crystals lady from Crystals and More always has an amazing display on hand. This is something I must have a go at.